One of Brazil’s most popular lotteries is Mega-Sena, a bi-weekly lottery game that’s all about simplicity. Playing the game is a straightforward affair, so even lottery neophytes can easily grasp the mechanics of the game. That doesn’t mean Mega-Sena doesn’t have a few surprises up its sleeve though. In fact, it’s mechanics, while easy to learn, are quite unique as far as lotteries go. Plus, they also hold a yearly draw wherein larger jackpots await you. Intrigued yet? Join me as I take a closer look! Mega-Sena has been in the lottery scene since its launch in 1996. Operated by Caixa Economica Federal Bank since its inception, the lottery game’s formula has largely remained the same (though, of course, with some adjustments for improving the game). Mega-Sena’s aim is to help cultivate social and cultural advancement in Brazil, so around 48%-54% of the lottery’s proceeds go to various programs that further their cause. Very Simple: Mega-Sena is very simple to grasp and devoid of overly complicated rules—which should make newcomers as well as lottery veterans happy. Bi-Weekly Draw: You get more chances of winning every week as Mega-Sena draws are held every Wednesdays and Saturdays. Jackpots Grow: When nobody wins the jackpot, it simply rolls over to the next drawing. The good thing is there is no rollover cap. Minimum Jackpot: Mega-Sena has a guaranteed minimum jackpot of R$2 million. Unique Mechanics: While Mega-Sena is a very straightforward lottery game, its mechanics are quite unique. For instance, it only has 3 prize tiers. The Mega da Virada: Once a year, this special drawing—which offers large jackpots—is held. Much like most lotteries, you play Mega-Sena by selecting 6 numbers from a pool of 1-60. If you match all your numbers, you win the jackpot. If, on the other hand, you match less, you win a lower tier prize, depending on how many of your numbers are correct. Easy, right? Here’s where it gets interesting. Unlike most lottery games, Mega-Sena only has three prize tiers. So, while the odds of winning the second or third prize tiers (more on those later) aren’t half bad, other lotteries look better in comparison because the prize tiers go beyond 3. However, because there are only 3 tiers, a larger percentage of the prize fund goes to winners compared to other lotteries. Prizes constitute of approximately 46% of the income from ticket sales. 35% of the fund goes to jackpot winners, while 19% each goes to the low tier winners. 5%, meanwhile, accumulates over time for the yearly Mega da Virada. Another thing that differentiates Mega-Sena from the rest of the pack is in how drawings are done. The six balls are drawn from two separate drums. For each winning number, two balls are picked separately from each drum to form a 2-digit number. One number is drawn from a drum that contains the numbers 0 to 5, while the other drum contains the numbers 0 to 9. If 00 is drawn, then it’s automatically counted as 60. Every year, on New Year’s Eve, Mega-Sena holds a special drawing called the Mega Da Virada. This special game is played exactly like the regular Mega-Sena games—where you need to match 6 numbers to win the jackpot—but differs a bit when it comes to the jackpot. It’s one of the more popular games among Brazilians because it usually offers large prizes. Beyond that, the Mega Da Virada also differs from the regular game in that jackpots don’t rollover when no one matches the 6 winning numbers. Instead, it goes to those who match 5 numbers. One unfortunate side effect of their better-than-the-norm odds, as well as their three-tier prize structure, is that it’s now become more possible to share the prize with a lot of players. Not that it is guaranteed to happen—just more likely. If you win in any of Mega-Sena’s prize tiers, your winnings are subject to 13.8% income tax. 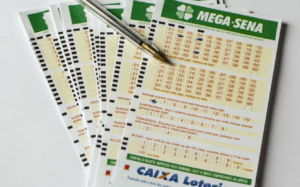 Winners can claim prizes up to R$1,787.77 from lottery houses, while anything above that would have to be claimed from the Caixa Econômica Federal bank. Winners have up to 90 days to claim prizes, but if no one comes forward within that time frame, the prize is funneled into the national treasury to be distributed to educational programs. Mega-Sena is operated by a government-owned bank—one of Brazil’s biggest. The Mega da Virada often offers prizes that go up to 9-digits. The largest Mega da Virada jackpot won was R$244 million. It was shared by three winners in 2012. Renne Senna, the winner of a R$52 million jackpot in 2005, was murdered not long after his big win. Adriana Almeida, Senna’s widow, was suspected to have concocted the murder so she could inherit the money. In 2011, however, she was found innocent of the crime and was acquitted. What are you waiting for? YOU could be the next Mega-Sena jackpot winner! Mega-Sena is one of Brazil’s biggest lotteries for a reason: it’s simple and straightforward, and you can win big. Though the 3-tier structure of the game means you’d have to match a good chunk of your numbers to be able to win anything, the odds aren’t half bad. Plus, it means larger portions of the prize funds—compared to other lotteries—can be allocated to each tier. Even better, you get two chances to win every week. And, if no one wins in a draw, it only means that the jackpot will grow on the next. If that’s not enough, there’s also the yearly Mega da Virada drawing that gives you the chance to win big, 9-digit prizes. So, what are you waiting for? Three of my numbers dropped. So I want to know if there is going to be a winning price for me? Hey, Nathaniel. Mega Sena only has 3 prize tiers: 6, 5, or 4 number matches. Unfortunately, 3-number matches don’t qualify for a prize. Good luck on your next try!